When you look at the explosive growth of wine in the United States, you’d think that grape-based distilled spirits would also be wildly popular, but they aren’t. 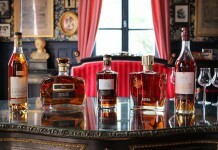 For some odd reason grape based spirits like brandy, cognac, and armagnac are often absent from many home liquor cabinets, and are rarely found on many conventional cocktail menus. Brandy seems to have gotten a bum rap: it is often relegated to a ‘cooking spirit’ and ignored by lifestyle press. But brandy is delicious, and not only does it deliver some of the great flavors people are drawn to with wine, it’s also quite compatible with food. American brandy is also pound for pound one of the most affordable aged products on the market, and a majority of American brandy (60%) is actually made and consumed in the United States. So why aren’t more people drinking it? The answer may come down to perception. Because of its relatively low price, American brandy often is considered ‘cheap’, so instead of looking at the immense value in the spirit category, it’s dismissed for being priced so low. For us, it wasn’t until we had an opportunity to blind taste American brandy next to all the other kinds of brandy at the San Francisco World Spirits Competition that the lightbulb really turned on. Divorced of all of the perception issues, we discovered a delightful spirit that not only captured what we love about grapes but also what we love about spirit aged in American Oak barrels. That spirit that we fell for was Paul Masson Brandy. Paul Masson Brandy is made from “premium grapes” distilled and blended in central California, then aged and bottled in Bardstown, KY at the Tom Moore distillery alongside bourbon from Sazerac. 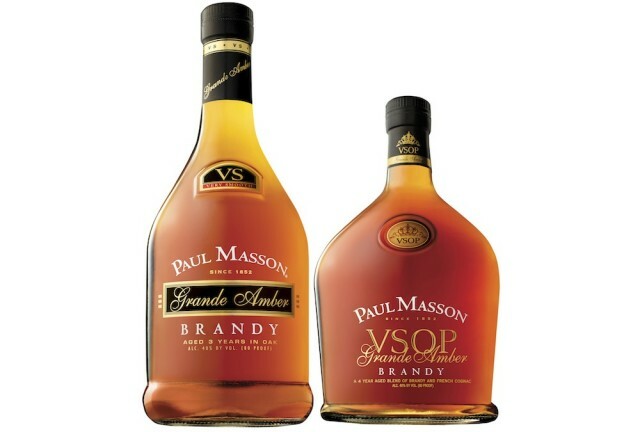 Paul Masson Grande Amber Brandy VS (80 proof / 40%, $14) – that’s right, $14 a bottle for a product that has been aged for three years in oak. Most VS Cognac sells for twice that price, and even most vodkas (which aren’t aged) sell for more. Golden brown in color, the Grand Amber VS has a very light nose with vanilla, chocolate, and light oak.The entry is very flavorful with pear, raisin, dried fruit, vanilla, and caramel nicely balanced with oak spice. The flavors only intensify in the midpalate where the oak spice increases. The finish is fairly dry with a little heat and it captures the oak spice along with dried fruit, vanilla, and caramel. Three years is still a relatively young spot for an aged grape distillate, and this youth does show on the finish, but it’s still a very drinkable and enjoyable brandy. Paul Masson Grande Amber Brandy VS is a light, pleasing American brandy which does a great job of integrating the sweet and spicy notes into an eminently drinkable spirit. At this price it’s also a spirit that doesn’t have to be treated with any pretense. Paul Masson VS does exceptionally well in tonic, with ginger ale, and it’s even good in Coke and far less assertive than a Jack and Coke. For people stepping up from unaged spirits like vodka, a brandy like this one is an easy way to begin to enjoy the impact of oak on a spirit that is still relatively light, flavorful, and easy. Paul Masson Grande Amber Brandy VSOP (80 proof / 40% ABV, $12) – another shockingly low price for a spirit that has been aged for four years! The Paul Masson Grande Amber VSOP is actually a blend of American brandy and French cognac, mostly from the the Bon Bois region of Cognac, and all at least four years old. Dark amber in color, the VSOP has a wonderful dried fruit note in the nose, joined by a nice oak spice, ginger, vanilla, and dark chocolate. The American oak bourbon barrel is clearly there but it doesn’t overpower the underlining brandy. The entry is sweet and fruity with remarkable cognac characteristics. It isn’t until we get to the midpalate where the American oak notes really being to emerge. While the oak is clearly there in the midpalate, it isn’t overpowering nor does it overwhelm the other flavors there including vanilla, caramel, iris, ginger, and raisin. It’s really hard to believe the level of flavor and complexity here in such a rock-bottom priced spirit. The ginger from the midpalate combines from the oak spice to lead the finish which is slightly spicy, fairly soft, and easy with a soft, sweet, and light undertone of caramel and fruit. Paul Masson Grande Amber Brandy VSOP is a superb example of great American brandy: it captures all the wonderful qualities that a grape brandy can offer and then adds the signature notes from American oak that help really distinguish the spirit as something decidedly American. It’s hard not to keep coming back for the price, too – $12! It’s shockingly low and may be the most underpriced and undervalued spirit on the market. Paul Masson Grande Amber VSOP is so easy, so enjoyable, and so affordable, it’s easy to see drinking it as casually as you would a bottle of wine. As with the VS, the VSOP goes well in tonic, is good with ginger ale, and is great sipped neat on its own. Paul Masson Brandy is proof positive that good spirits don’t have to be expensive and that low priced spirits can be quite good. There’s so much attention given to American whiskey, it’s a shame that more people aren’t seeking out American brandy as a great alternative that’s easier on the palate and on the pocketbook.